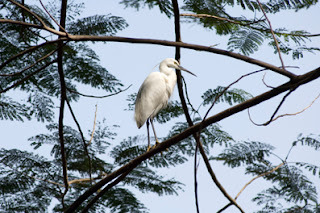 OSHO bytes: Can you listen to the birds? Can you listen to the birds? I have heard Osho say that if you listen to the birds in the morning you will be able to listen to people throughout the day. Why listening has become so important these days? Because everybody exclaims, "Nobody listens to me!" Whether it is a child or a parent; a teacher or student, everyone feels they are not heard. It is so frustrating that you cannot share yourself with others. Listening is never easy but it is crucial in relationships. It involves overcoming the habitual tendency of the mind to block itself. People have stopped listening because they have stopped conneting from the heart. Everyone loves to hear the sound of their own voice but not that of the other's. It is interesting to know why people avoid listening to others. To listen deeply means to be vulnerable, to expose yourself to the other, to change your ideas and values.
" It requires a certain maturity, an openness to understand values and points of view very different from our own. When we really listen, our own ideas and values are sometimes altered . Listening is intensely demanding and therefore should not be entered into lightly.” -Robert Bolton, People Skills. Osho says: " Once you know how to listen, in deep receptivity, sensitivity, you are not there. The listener is not there, only listening. And when the listener is not there, there is no ego: there is no one who listens, only listening. And then it penetrates to the very core of your being. "If you listen to me with mind, you will miss. If you listen to the waterfall without mind, you will get. It is not a question of listening to me; it is a question somewhere concerned with you, with the listener. What I am saying is irrelevant; who is saying it is irrelevant. The whole thing is: are you surrounded by a deep silence? Have you become non-existent in that moment? Do you find suddenly that you are not, that you are a deep emptiness, throbbing with life, full, but empty, a tremendous silence, with not a single ripple of thought? Only then do you attain to a plane where truth can penetrate you. So try to be a listener. Just hearing is not enough. Hear, you can; listening will need great discipline. It is the greatest discipline there is. If you listen, you are already delivered; because in that listening, suddenly you find yourself. And listening to sounds will be very helpful. Not to any sound in particular, because that becomes a concentration. this noise of the train... the traffic, some dog starts barking... an airplane passes by; all have to be accepted. Not that you have to concentrate on any sound – listen to all sounds from everywhere. You have just to be alert, listening, with no choice. That will help you immensely and that will become your meditation." Don't call problem a "problem"